Over the course of a career that has spanned more than two decades, Charles Deenen (Need for Speed, Fast & Furious 1 and 2) has been involved in the creation of over 200 games, numerous films, and dozens of film trailers. In this interview, Charles shares some of his experiences as one of the video game world’s premier Sound Designers. My first endeavor with sound was during the early '80s with sound-chip based audio. Let me say that trying to make semi realistic sounds with just pulse and noise waveforms and no DSP was interesting training. In a sense, Sound Design evolved since then. Even in those early ages, Sound Design wasn't just about making "sounds"; it was about making an experience helped by sound. Computer games were my first wave-form based introduction to Sound Design, and still today is my primary work. I "grew up" into Sound Design, into sound manipulation and experiences, not something I really consciously went after. One of my first introductions to DSP-based sound mangling was Waves. I just realized how odd it is that even after 18 years I'm sometimes still reaching for that same plugin. For a DSP plugin to stand that test of time, it has to be good and useful. What are the differences between Sound Design for games vs. films? The two media are merging closer and closer every day, and also dividing further into their own status. Games used to take "film" as the main emotional goal to achieve, but its become a media of its own, with its own challenges. You create experiences vs. watching an experience. It has taken years for computer/game oriented sound development to merge with the artistic, picture-based, sound development. Naturally, linearity vs. interactivity is the big difference. In film, you have the great benefit of knowing exactly when something will happen. In common gaming, things can happen at any time. There are story-based, semi-linear games which resemble the linearity of a film much closer, but only some events happen on a linear basis, the time base is still variable. Instead of creating one perfectly crafted experience with picture and sound in a linear media like film, in games you have to create these experience on the fly. You're trying to set up logic to mimic how you expect it to sound. To make this logic behave and understand the emotional aspect you'd get from linear media isn't always possible. The creation of the sounds is also not similar. In film, you hardly have a track limit; you have a good understanding what the sound has to go up against from all perspectives, layers, and time-based placement. Hard drive and memory space isn't an issue. Games, on the other hand, still have restrictions in terms of memory, bandwidth, rapid adaptation of sounds, etc. Therefore, DSP is a huge factor in console and PC games, helping you constantly shape each sound to live with each other in a rapidly evolving soundscape. As an example, a dragon in a movie will fly that perfect path every time. However, in games, artificial intelligence will setup that flight path, and it will be different every time. You can see how you'd have to create smart ways on how to still make it feel as dynamic and alive as that perfectly crafted single animation you'd see in linear media. How do you see your role as a Sound Designer? As a story teller and/or experience shaper, a Sound Designer acts as an emotional enhancer to the visuals, working together with the picture to create a unique believable experience. As a crafter, I'll create, find, record and shape sounds, which help or enable the storytelling and/or experience aspect. And finally, I see the Sound Designer as a crucial part of the overall team that's building the experience. At what point during the film, commercial, and game making process do you get involved? With any film I've been involved with, I usually get involved during the last few months as somebody to help enhance the experience through sound that's been setup by the director, sound supervisor, or other. With a game, you're often involved from the beginning, as sound is so reliant on other systems to work in tandem to create these dynamic environments. It's virtually impossible for a design team to know all these factors, as there's a more to it than simply putting sounds on a timeline and mixing them like film. With a commercial or trailer, it totally depends. If the media is very sound-intensive, I'm usually involved from day one, to help shape the experience and/or message that the media has to express. From your body of work, what are you especially proud of? That's hard to say for me, since work I did a month ago could have been improved upon, and am no longer “proud” of it, per se. That doesn't mean it's not good, but there's always room for improvement. As a Sound Designer, you're constantly growing. In the end, what I'm proud of is the work that helped the experience, or what still gets people jazzed. I'm still proud of some of the early '80s work we did on the C64, Amiga and such. I'm also proud of any work that doesn't get noticed in the experience, but without it, would make the experience fall apart. My main base is Electronic Arts Vancouver, with a campus the size of a city block, it seems. It includes a basketball court, soccer field, Olympic size gym, theatres, and so on. We have a lot of sound editing rooms in a five story building and some world-class mix studios and recording rooms in the basement. What really makes the workplace is the staff—a lot of wonderful talented people who collaborate together on creating what they do best: an experience enhanced by sound. I also do a lot of my work from home, where I can focus for 24 hours a day if need be. The studio there is modest, taking up a floor of my house near the water in Port Moody, BC, Canada. A machine room houses a few Macs, Pro Tools rig and 30+ TB servers. The mixing/editing room houses a 24-channel Digi mixer, a few racks of outboard gear and 10-foot projection. When we purchased the house, we gutted the whole floor, which incidentally had a 12-foot ceilings, and built the rooms from the ground up, meant as a private facility only. I've done a lot of the final mixes there for our game cinematics as well as trailers, film pre-dubs, etc. 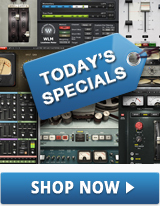 The Pro Tools rig is loaded with virtually all plugins, including all the Waves plugins. It's great that the Waves plugs are in several formats, so you can use the same plugin chains in Pro Tools and Soundminer. How big a part does processing play in Sound Design? It can play as big or small a part as the picture asks for. There are times when processing is the only way to go, but there are times you can go too far. Sound Design to me should never cry out for attention, focus. Processing is done to enhance what doesn't exist. For example, a car can sound great, but doesn't always sound beefy, so you use processing and design to add to that particular character of the car. With any factor, Sound Design can quickly go into the non believable stages. The moment it crossed the boundary of believability, we as Sound Designers have gone too far. Do you record your own effects for each project? As much as possible, yes, as that's the fun part. Recording new sounds always sparks the imagination and allows you to record them in a space that works for the picture/scene that you're crafting. Faking something can only go as far as the human ear allows you to go. How involved are you in the final mix? It depends on the project. In games and commercials, I often do the final mix, and if not, I make sure we hire people who really understand the media. Mixing is something I've learned over the last 20 years, getting better every year, honing in on what's expected, focus, etc. It wasn't until recently that I'm comfortable with my mixing skills and no longer question my gut instinct. I've learned to trust myself. You recently received a lifetime achievement award from GANG, the Game Audio Network Guild. What do you think keeps you at the forefront of your industry? Passion. Passion is what drives me, along with the dedication to try and make anything I'm involved with as good as possible. If you take the passion out of a project, I tune out too. There is so much to learn, so much to invent, so much still to do in interactive media; we're only just starting to break into “believable” audio. The techniques involved are very different from film, and so each invention of aural believability is a breakthrough. How do you see the future of Sound Design? I see a whole new generation of Sound Designers evolving. Sound Design schools are now the norm; "Sound Design for gaming" is now a class you can take. These students learn in one or two years what all of us had to learn, and often invent, in 10 years or more. I'm amazed what some of these guys do, and the future will be shaped by them. How do you create soundscapes that translate well no matter what the gamer’s system? I want to say we wish to do so, but don't always succeed. The problem is not so much the gamer's system, it’s their setup. We have to make soundscapes that sound good on anything from a one-inch speaker in laptops to a massive 7.1 system, in an interactive way, in real-time. That's not easy to accomplish. While others might mix in large 5.1 rooms, I often start from the smallest: one-inch stereo Radio Shack speakers at very low volume. Once it sounds good on those, I can embellish into larger speakers and surround and higher volumes. It's quite easy to make something sound nice loud in 5.1. It takes years to really understand how to mix in 5.1 while not making it cluttered in stereo and low volume, and only give focus to those elements needed at that particular time in the interactive soundscape. So I learned it the opposite way, by starting in stereo, and then understanding what works and what sound elements are really not needed. A sophisticated mixing system is really important in making translatable soundscapes in games. Even today I still see mixes done with static values and a couple of snapshots. The game industry in general still has a long way to go with real-time mixing, beyond standard use of real-time DSP to enable a wonderful emotionally stimulating, believable soundscape. As a driving force behind the creation of the Waves Sound Design Suite, together with Scott Martin Gershin, what makes it powerful in your opinion? Since Sound Designers are not rich folks like some of our music brothers, the most valuable plugins at a good price-point was key. For the Sound Design Suite, we honed in what both Scott and I found to be the most useful plugs in the current Waves arsenal, at a reasonable price. C4 Multiband Compressor – Great for de-noising some sounds (using the multi-band gating functions), and awesome to "level" out frequencies on recordings (if you don't mind them being compressed). MetaFlanger – Set this to extreme speeds, and modulate the frequency of this speed in real-time to create some crazy sounds. At extreme settings, this flanger becomes a sound design beast all by itself! DeEsser - When sounds have too much hi-end in spots, the DeEsser can help you out. Since it's basically a "banded" compressor, you pick the frequency band that needs ducking. Doubler – Great for widening and thickening sounds. Think of it as four pitch-shifters, with separate pan delay, and modulation plus EQ. Great chorusing sounds too. Doppler – The only plugin of its kind. Great tool to create subtle movement as well, especially if you layer multiple together with subtle effects. GTR3 – Unlimited amounts of multi-effects processing. Don't think of these as guitar effects; think of them as modulators you can stack up in various ways. H-Delay – My favorite use of H-Delay is to generate sub-harmonics. I use it inline with LoAir to create mega "sustained" sub bass. L1 Ultramaximizer – One of my favorite plugins. You can use it from anything as a final limiter to crunching your sounds to the max. One tip to try is to route two L1s together, one set to very light limiting, and one that crunches the sound to the max, and then balancing accordingly. Also, play with the release. Short releases create more distortion; longer releases smoothen out the sound. L2 Ultramaximizer – Similar to the L1, but safer to use on variable sounds due to the automatic release setting. It also will introduce less "crunch", so if you're just after smashing the loudness of a sound without additional crunch, this is your go-to plugin. It's so easy to use in comparison to some other limiters. Set the amount of dB you want it louder and forget about it. LoAir – A clean, low-end tonal generator, LoAir is the new sub-harm standard. Together with Renaissance Bass, it's a lethal combo. MondoMod - This plug can create some great movement. When you quickly have to create a volume modulated sound that cuts through a mix, MondoMod is a great plug to it quickly. Morphoder – Simple to use vocoder, great for robotic voices and special effects. Renaissance Bass – It's been my go-to "beefinizer" for many years; I probably use it every day. Stacking two of them up at different frequencies makes both the sub and mid-range bigger. Even at zero dB, it adds a significant amount of low end. Renaissance Compressor – My go-to "regular" compressor. It's transparent enough when you don't want to hear it, and can pump when you want it to. Often I'll use two in a row-- one to "level" things a bit with a long attack/release, and one to slightly compress things. Also works great on voiceovers. I've tried many other compressors, but seem to always come back to this one. Renaissance Equalizer – A longtime favorite for ease-of-use. When I transfer sounds from Soundminer into Pro Tools, this plugin will often be part of that chain. S1 Stereo Imager – Great tool to shift stereo images, make them wider, and even emulate the "S" signal in LCRS recordings. It's basically an "ultra-panner" that goes beyond the stereo spectrum, with the ability to shift imagery inside of the width you've established. SoundShifter – My go-to plugin for time and pitch shaping. Since you can draw them independently, you can create awesome sweeteners with it. Set up some radical pitch changes over very short time amounts, and you’ll find you can make tons of new tonal sources out of old recordings. SuperTap - I love this plug, as it reminds me of an old favorite hardware unit. In extreme cases, you can create all sorts of stereo-imaged movement sounds. Use the filters on the channels to create crazy delays. TransX – Fantastic plug to create more punch on virtually anything. A favorite for me on any trailer sound I build, to ensure it cuts through a dense mix and has that "impact" that people expect. UltraPitch – I still find new ways to use this plug! Play with the settings while running anything through it, and you'll find some interesting things.